This is my first attempt at kumihimo! It is so relaxing and fun to create braids on my new marudai. This is my marudai all set up with my current braiding project. It's in my "studio". Here I am working on a braid. I went to a meeting of the Diablo Weavers Guild last week. We learned how to do kumihimo. I can't believe that was the agenda that day, because the day before I had received my marudai in the mail. I am totally hooked on kumihimo! It is so relaxing and it takes a bit of brain power to figure out the patterns. I went to the Bay Area Bead Bazaar on Saturday, and saw a lot of braiding and micro-knotting (macrame'). I am so amazed that as soon as I get into something, it seems that I meet all kinds of people doing it too. I joined a small loom weavers Yahoo! group and a kumihimo Yahoo! group. I am learning so much right now. 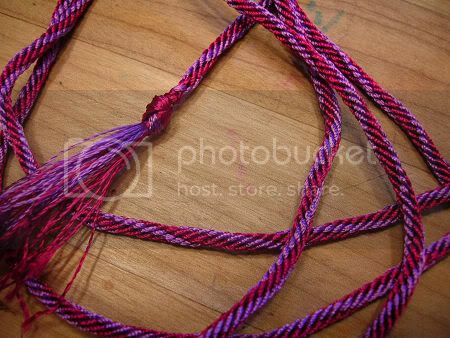 I am learning how to do Saxon braiding on a small cardboard loom and I just got a pretty little lucet to make simple cording. 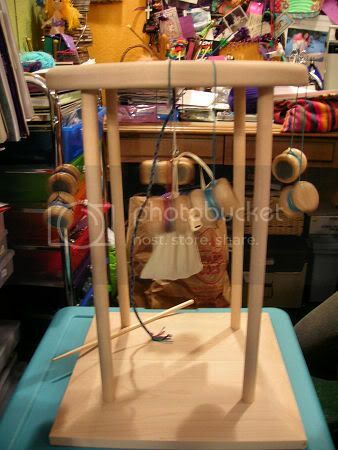 It is similar to a knitting spool, but it only has 2 prongs. I have also been doing A LOT of freeform crochet. I have been playing around with thread crochet and adding beads. I am signed up to take another class on Overlay Crochet at the CGOA conference at the end of April. My fiber and bead art is really evolving right now. If only I can get some more pictures of my work. 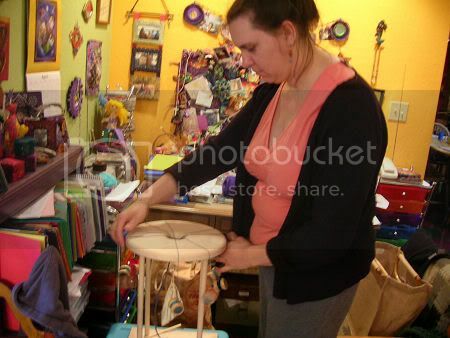 Watch for more creations from Creative Caravan coming soon!